People felt very strongly about this section of the questionnaire. Speed reduction measures were regarded as being an important issue. Many residents would like cameras or flashing speed restrictions signs installed. A large number want a 20 mph limit throughout the village and more speed bumps installed along the High Street, Gordon Street, Park Avenue and Bridge Road. A number of people suggested that Sutton should become a one-way system. The chief concern identified is an urgent need to stop cars from speeding. Road and Pedestrian Safety was another area which residents felt strongly about. Individuals felt a Pelican Crossing is needed on Home Bridge and Main Street opposite the C. E. School. A lollypop attendant was also requested for the C. E. School. A number of people suggested a mini roundabout should be placed near the Bull, parking on pavements should be banned and a Zebra Crossing should be placed between the Post Office and the chemist shop. Again, concerns were raised about the speed of traffic along the streets especially coming down the Ellers and along Main Street. Resident parking is an issue of concern within the village. There is a demand for parking along the Main Street, Ellers Road and West Lane. It was felt that Main Street was very bad on Sundays with cars parked on both sides causing major problems. It was suggested people attending football games in the Park should park in the Baptist Church car park. There was considerable concern about the dangers caused by vehicles parking on pavements which forces pedestrians, particularly with pushchairs, to walk in the road. Several suggestions were made of areas which could be used for car parks which included: Greenroyd Mills, Alvic field, part of the Park, Toilet block and the Sand Park. There was a strong wish to see resident permit parking and more yellow lines around the village. A request was made for more garages to be provided. 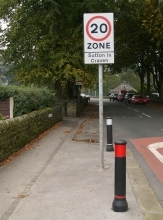 Many people felt pavements need to be installed particularly on Sutton Lane and the High Street.